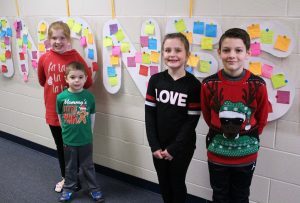 Pictured from left: Grace Evans, Sam Barton, Rylee McKinley and Cain martin stand in front of the school’s Kindness Wall. Center McMechen Elementary students are once again completing 30 Days of Kindness. They were challenged to complete at least one act of kindness every day in December. The students have completed service projects during those 30 days that included writing letters to the Military, collecting food for the Marshall County Animal Shelter, donating socks to the House of Hagar and Marshall County Family Resource Center, writing cards for the Cancer Kids Project and collecting fixings for a complete spaghetti dinner for patrons of one or more local organizations that provide meals for the needy. 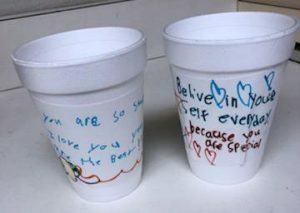 The students’ favorite project was filling cups with hot chocolate mixes and kind messages for the warming shelter. Students have also exchanged names in a “secret pal” activity where they are to focus on doing “kind deeds” for their pal for two weeks. 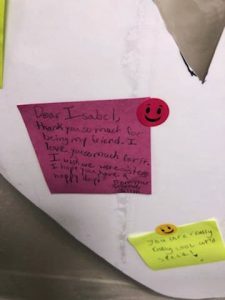 There is also a Kindness Wall where students and staff can leave kind messages or a “Thank You” for each other on sticky notes. Students have enjoyed completing 30 Days of Kindness all month.